Here are some illustrations of simple massage moves for the head. 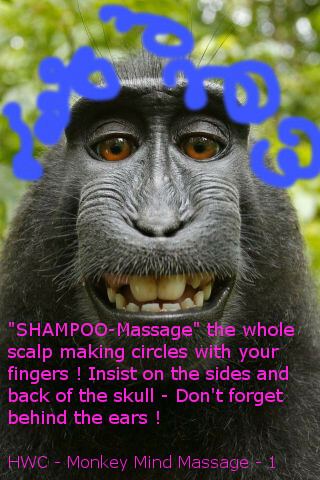 Together in a sequence they make for a lovely treat we like to call the Monkey Mind Massage, very helpful to calm a restless mind. Applied in a moment of crisis and/or regularly, it can help slow down a hyper-active intellect, pause ruminations and worries, regain clear vision, find peace, and alleviate symptoms such as insomnia, anxiety, irritability, headaches, and more. Like in most massages, it is the affectionate and patient repetition of the moves that will make a difference, not just the technique. 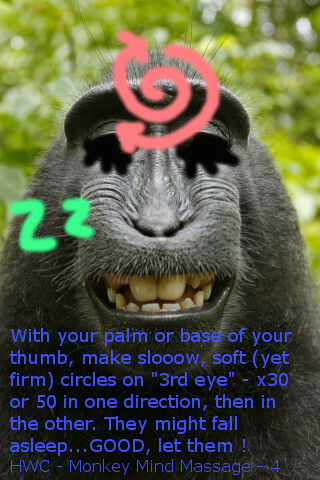 The moves on the forehead, for example, would ideally be repeated 30 times, without rushing. Pressure and rhythm would ideally vary, according to your friend's tastes and your own instincts about them; From light to quite strong, super slow to moderately fast. 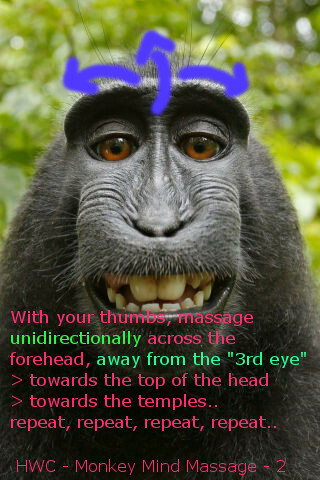 The Monkey Mind massage is best applied with your friend lying down on the their back and you sitting at their head. For more information see the “Getting Ready” section. 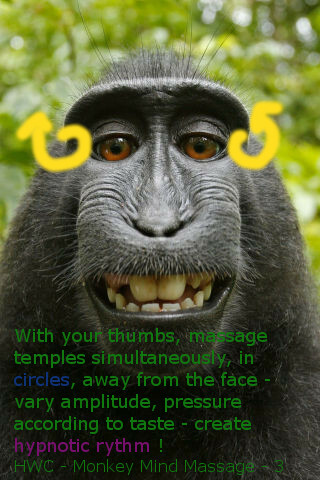 You can also practice as an auto-massage. Additional moves, detailed instructions, and workshops (like the one we did during last CCC camp in the summer) are to come. This massage has moves in common with the PRE-MOON MASSAGE, which begins with head and face massage to calm the mind and take the heat/hyperactivity down.